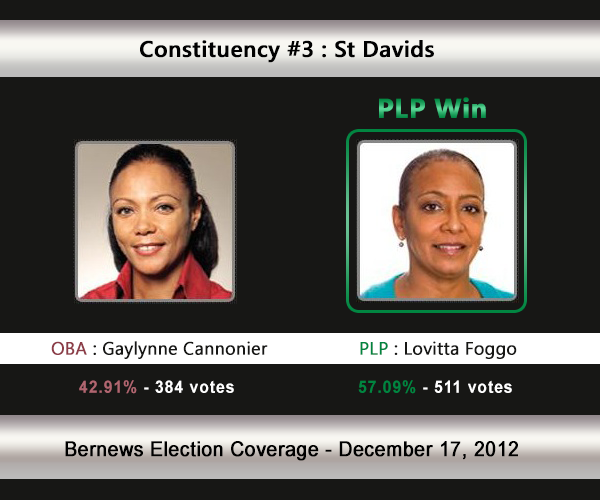 [UPDATE Dec 17: Election Results] Incumbent Lovitta Foggo [PLP] has retained her seat against a challenge from Gaylynne Cannonier [OBA] in C#3 St David’s. The Opposition Leader’s sister Gaylynne Cannonier will challenge the PLP’s Lovitta Foggo. The polling station is Clearwater Middle School, 2 St. David’s Road. In the 2007 General Election, Ms Foggo defeated the UBP’s Suzann Roberts Holshouser, receiving 54.27% of the vote. In the 2003 General Election, Suzann Roberts Holshouser [UBP] won with 50.96% of the vote against Danvers Seymour [PLP] who received 49.04%. 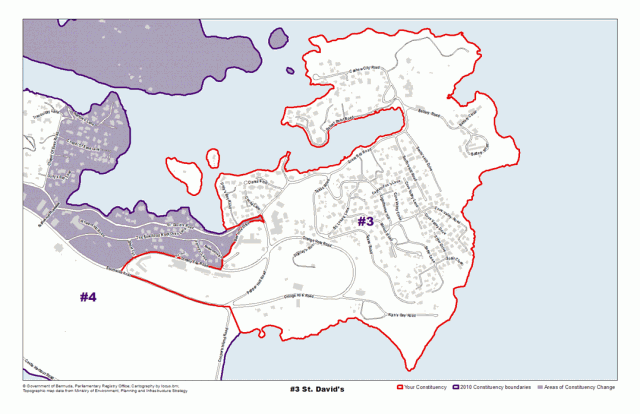 Areas the St David’s constituency compromise, or is located by, include St. David’s Road, Chapel of Ease Road, Southside Road, Lower Gates Road and Great Oswego Island areas. Lovitta Foggo has been a resident of St. David’s for over twenty years. She attended East End Primary School, The Berkeley Institute, and Northeastern University, achieving her undergraduate degree in Biology and in Education in 1982. Passionate about politics, MP Foggo, has taken the view that, at this stage of her life, she better serves her community as its political ambassador. MP Foggo pledged to work diligently and arduously to address the concerns of St. David’s residents and continues to do so, as evidenced by her continuous weekly canvassing, and monthly clinics throughout the years and the many accomplishments in her constituency on behalf of the residents. She strives hard to effect change for her constituents when such is for the benefit of the people, community and/or Bermuda. MP Foggo was a key force behind the building of the Lamb Foggo Urgent Care Centre at Southside. She served on the St. George Parish Council as Chairman of the Scholarship Sub-Committee and as Treasurer, and as Deputy Chair of both CedarBridge Academy and the Education Appeals Board. Now she sits on the Child Care Placement Board, the National Training Board and is the Chairman of the Public Service Vehicles Licensing Board. In Parliament she serves on the Public Accounts Committee, the Private Bills Committee, the Audit Committee, the committee responsible for overseeing the Standing Orders for parliamentarians, the Regulations Committee and is a Commonwealth Parliamentary Association executive member of the Bermuda Branch. Added to these responsibilities MP Foggo served on the Joint Select Committees for Education and Guns and Violent Crimes. These committees were responsible for investigating the recommendations of the ‘Hopkin’s Report’ and the impact of guns and violent crimes in the community respectively. MP Foggo is the Government Whip, a position which requires ensuring Government’s success with legislation brought to the Lower House. In fact, she is the first female Chief Whip in the Commonwealth Parliamentary Association group of the Caribbean and Atlantic Region, a great historical feat. Ever trying to ensure that her participation and input on legislative matters is impeccable, MP Foggo has completed a Master’s degree in Public Administration and Development from the University of Birmingham in the UK (2010). She believes this pursuit has greatly enhanced her understanding of democracy, good governance, the Civil Service and the importance of active participation of civil society, and how each entity does and should interrelate. She firmly believes her role as a politician and parliamentarian is to be her brother’s keeper. She is guided by the motto from Mahatma Gandhi who said “Be the change you seek”. MP Foggo is the proud mother of two daughters, Amne & Zayna Foggo-Osseyran and the grandmother of Ari & Ayr Cannonier. Gaylynne is a St. David’s Islander whose roots in that community go back several generations to the Native American Indians who were among Bermuda’s early settlers. Her father was the late Legay Cannonier, a well-known Islander and cricketer. Her mother is Margo Cannonier Singleton, who worked for several years as the library administrator on the US Naval Base. Gaylynne’s character has been shaped by her life in St. David’s. From that community, she has learned the importance of a healthy community life, family values, a moral compass and respect for one’s neighbours. Gaylynne Cannonier’s character has been shaped by her life in St. David’s where she has learned the importance of a healthy community life, family values and respect for one’s neighbours. Because of these deep roots, Gaylynne is committed to finding solutions. She is no longer prepared to stand on the sidelines and watch gang violence erode her community, and is no longer prepared to see her home fall into a state of disrepair. “Finding solutions means changing what’s no longer working. We all need to become agents of positive change.” Gaylynne believes solutions for St David’s include more police on the beat, outreach programmes and a transitional housing plan to help families get back on their feet. She is adamant that having an Operation Ceasefire initiative in place in Bermuda will help to stamp out violence. The former owner and managing director of Foreign Cargo Limited, Gaylynne studied Interior Design at the British American College in London. Developing a love for travel and a curiosity for other cultures, she took the opportunity to work, live and study in Italy where she partnered with the American Language Institute in Florence and became a TOEFL certified English teacher. Fluent in Italian, Gaylynne has taught at both university and secondary schools in Europe. A committed community citizen, Gaylynne serves on the OBA Shadow Board for Housing, Planning and Environment where she works on solutions to address homelessness and the plight of those who live below the poverty line. In addition, she is a member of the Chamber of Commerce, the Bermuda Society of Interior Designers and a member of the St. David’s Islander Native Indian Heritage Group. Gaylynne’s love for her St. David’s community and her concern over Bermuda ‘s failing economy were the catalysts that brought her into politics. She’s convinced that without a change in government Bermuda will continue to head in the wrong direction. A firm believer in the OBA’s aims and principals, Gaylynne is happy to be part of a solution-driven team.